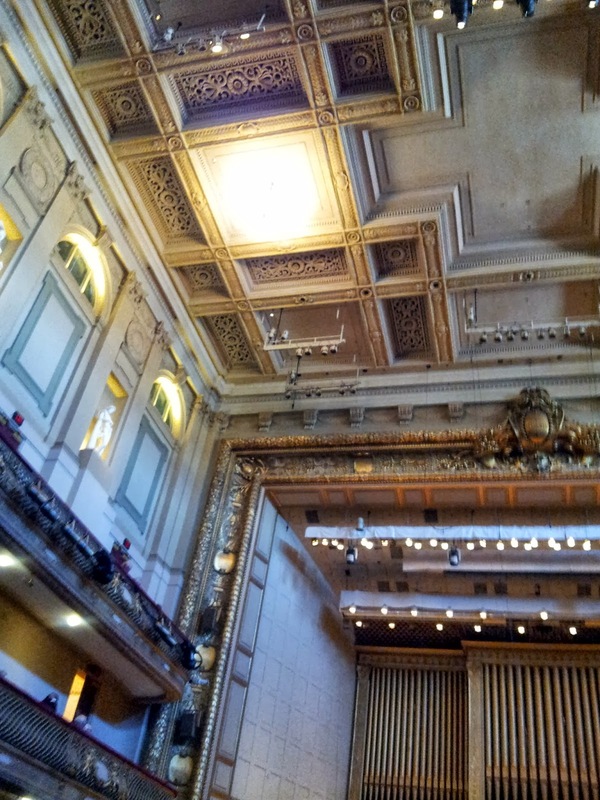 Since childhood, AMC has heard and read about the glories of Symphony Hall in Boston. 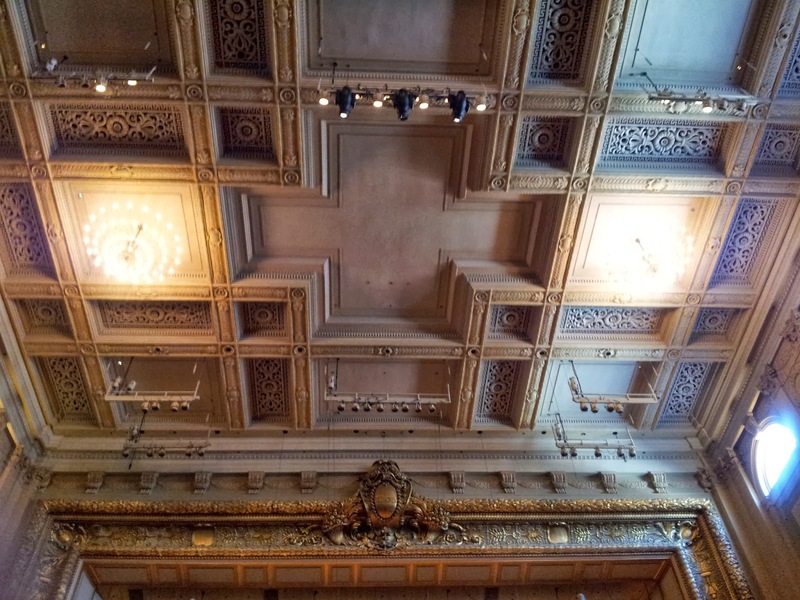 It has been hailed as one of the great halls in the world for its acoustics. AMC decided that it was time to travel to Boston and see and hear it firsthand. AMC will discuss the superficial first. From the outside, the hall is rather plain looking made up mostly of red brick. 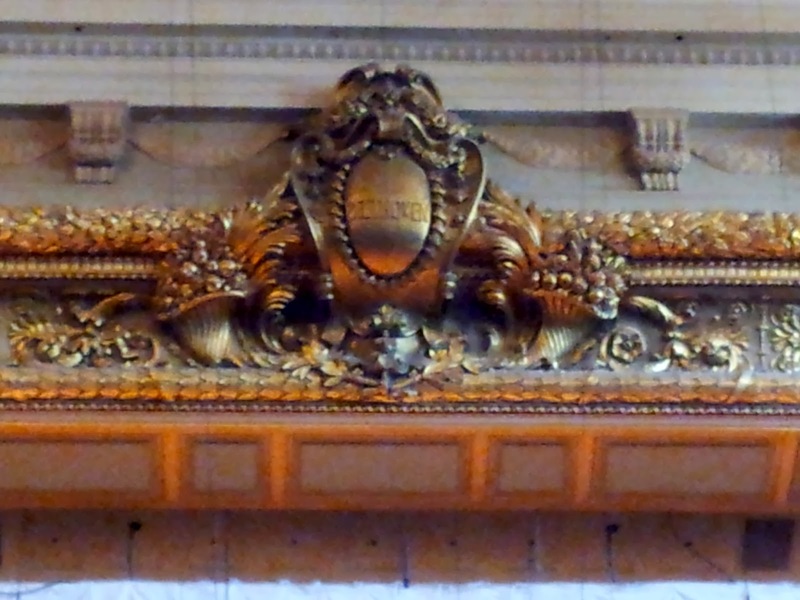 The pediment over the entrance on Huntington Avenue contains a blank shield where often one would see a frieze or carved letters. None here. This them of unfinished shields is carried into the hall itself. Actually there appears only one- directly over the stage- that is, in fact finished. It contains the name Beethoven. Apparently when the hall was built no agreement could be reached as to the names of other composers who should be honored in the various shields located around the proscenium arch. 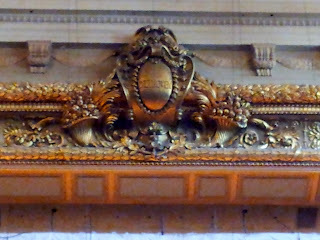 The decoration in the hall is of rather simple neo-classic design with what looks to be oxidized gold leaf. Some of the decorative plaster in the ceiling has been painted rather than gilded. There is a rather tattered red indoor-outdoor carpet around the hall. Around the hall are plaster statues that perch in niches. They struck AMC as almost tacky- like one might see in a Miami resort. Gray and a very light green are the colors used on the walls. 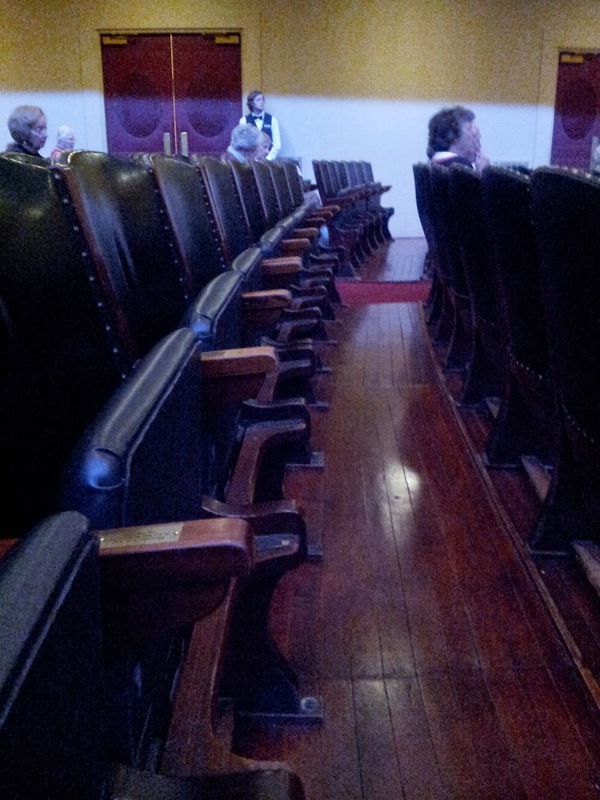 The hall contains the original leather seats. They are at once historic and brutally uncomfortable. They also make a loud "thud" when they are dropped because they are not spring loaded. The floor is all wood, and looks like it has been treated roughly. 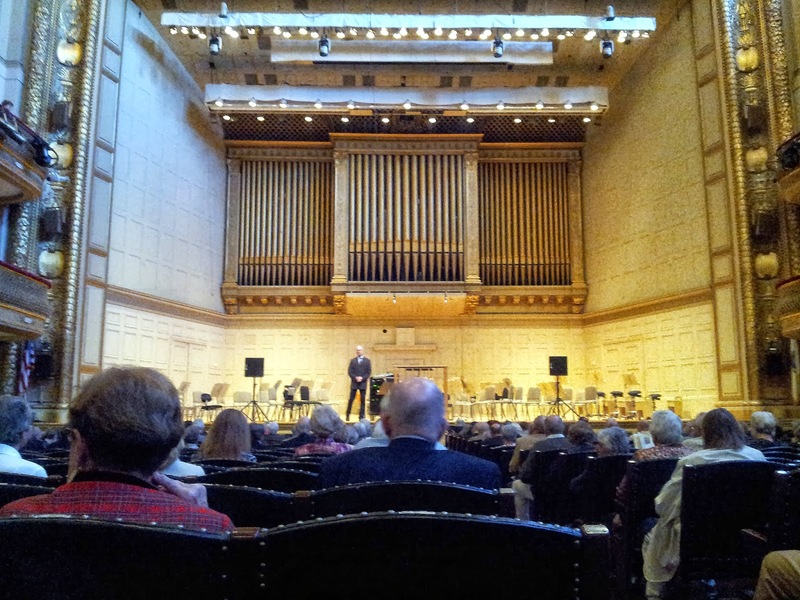 The auditorium is in the shoe-box shape that finds favor with many acousticians. 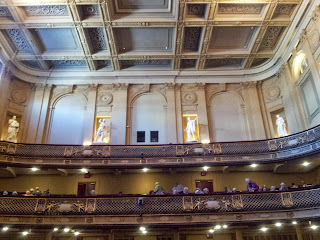 The walls move in a few feet as they move from the floor to the fist and then second balconies. This was an intentional part of the design to aid the sound propagation. AMC attended the Friday afternoon matinee performance. The house seemed to be totally sold. 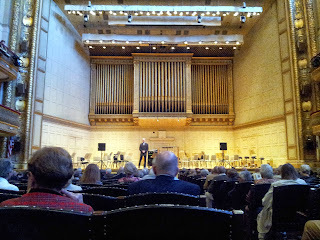 There was a pre-conference talk by a Symphony staff person (sorry- didn't get the name). Hewas musically savvy and present his commentary with humor and grace. From where AMC sat, he looked a bit like Tim Gunn and seemed to share Mr. Gunn's elegance. 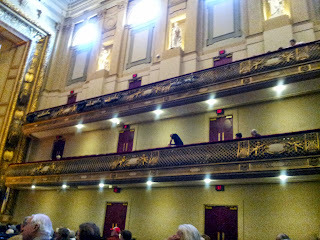 The conductor was Latvian Andris Nelsons, who is the Music director Designate of the BSO. At 32 years of age he has developed a fine reputation and being Music Director at the BSO will only add to that reputation. Mr. Nelsons is a fairly imposing looking man who sometimes leans over and nearly squats to get want he wants from the orchestra. He seemed to pay most attention to the winds, at least judging by where his body was angled. 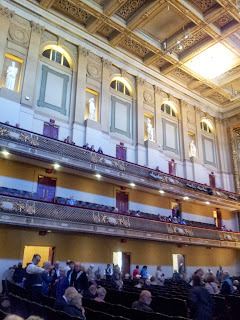 The concert began with Wagner's "Siegfried Idyll." (The program notes can be found here: http://bso.http.internapcdn.net/bso/images/program_notes/20131017.pdf. AMC generally likes Wagner and is somewhat envious that Herr Wagner could compose a piece of music as a gift to his wife, when AMC could never get much beyond a watch as a present. But AMC digresses. When the orchestra began to play, it was clear to AMC that it doesn't matter what the hall looks like because it does something magical with the sound of an orchestra. The strings are golden, the bass is solid and the winds occupy a space all of their own that provides a transparency that AMC has not hear before. The "Idyll" was performed beautifully but it is a very repetitive piece that uses the same Siegfried theme that it becomes uninteresting, in spite of Mr. Nelsons and his new orchestra. The next piece was Mozart's Piano Concerto No.25 with Paul Lewis as soloist. In the program booklet Mr. Lewis is described thus: "Internationally recognized as one of the leading pianists of his generation..." How many time AMC has read similar statements about nearly every young soloist. Again, in the interest of full disclosure, AMC has never shied away from letting everyone know of AMC's dislike of Mozart. And because of this, AMC is not in a position to make a proper judgment about Mr. Lewis' interpretation. Judging by the audience response it must have been very good. But AMC will observe that there appeared to be a nice collaborative relationship among soloist and conductor and orchestra. AMC also noticed that the sound during the performance was never muddy and the piano never sounded echo-y. The hall seems to have the very acoustics that everyone lauds it for. The final work was Brahms Third symphony. Again, in the interest of full disclosure, AMC has never shied away from letting everyone know that Brahms is one of AMC's favorite composers. So AMC feels fully equipped to review this performance. And what a performance it was. AMC has never heard a more unified performance where each section or the orchestra played its part as if only one instrument were playing. The strings, in addition to being warm and silky, played with breathtaking cohesion and unity. Only the very best orchestras play with this kind of unity. The woodwinds were also wonderful. 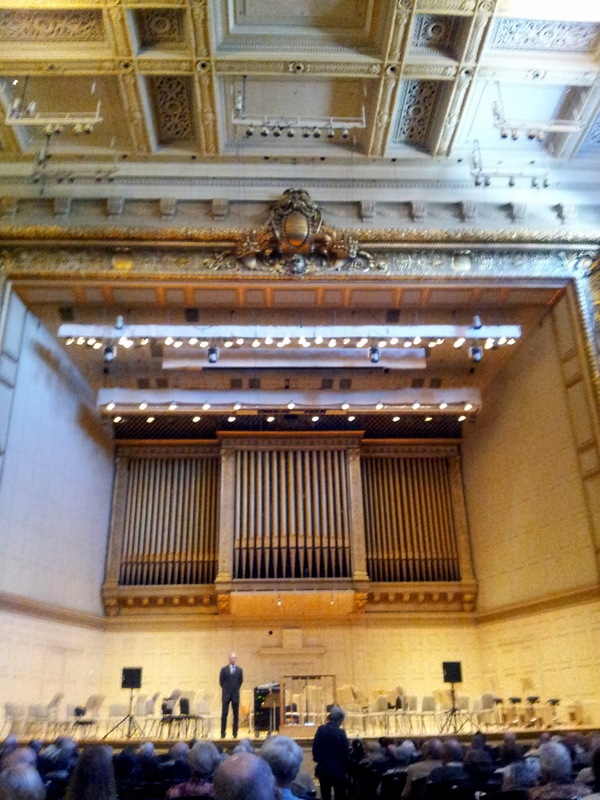 The English horn in particular had a warm glow that resonated beautifully in the hall. The contrabasson was delightfully buzzy and rich. The bass were solid- and there were nine of them! Every forte in the music sounded transparent and never loud. Rather from every pianissimo to every fortissimo, the sound was smooth and integrated. The best that AMC can come up with to characterize the sound is to ask the reader to imagine a large bubble, Every so often a new smooth portion of the bubble will pop out, but then recede back into the whole. 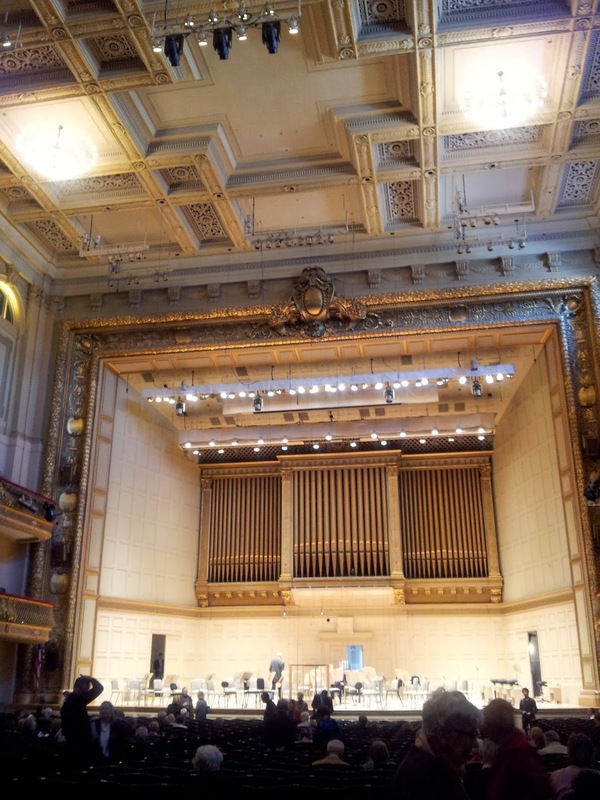 That's exactly how the sound of the BSO is. 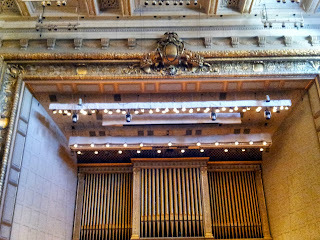 AMC felt it a real privilege to be able to hear this magnificent performance of an incredibly beautiful piece of music. The third movement (click here for a version conducted by sir John Barbiroll : http://www.youtube.com/watch?v=2tB2SLLnPZg:) is transcendent and it makes AMC wonder how a mere mortal could compose anything so beautiful. Maestro Nelsons seemed to understand the overall shape of the movement, which caused helped shape the entire movement rather than just the various sections within the movement. His tempi were also a bit faster than Barbarolli's in the YouTube clip. Nelsons was able to highlight the beauty without forgetting this is just one movement with its own structure that resides in an entire work with it overall structure. This was an amazing (AMC doesn't like this overused word but..) performance is a hall with golden acoustics. Just a word about the audience. It was old and AMC does mean old (not that there is anything wrong with that). But it did create a certain cache of its own. The antique seats were constantly being dropped when someone stood up. A woman behind me laughed from time to time. AMC thought maybe she was such an expert that she found what Maestro Nelsons was doing was humorous. But, alas, the laughing was simply random, and therefore, a bit annoying. Across the aisle from AMC sat someone who seemed to be breathing through some invisible CPAP machine. But the bright side is that AMC was lucky enough to sit next to a friendly and bright woman who could easily hold her own in a conversation about music. The BSO does not need AMC to say it, but it is a magnificent musical ensemble that deserves all of the praise it receives. it is truly in the top tier of orchestras in the world. 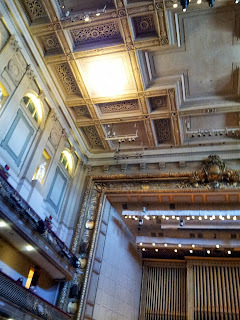 And the BSO Symphony Hall, while a bit run down around the edges, is an acoustical wonder. It is warm, reverberant, but never echo-y. Bostonians are indeed lucky to have both. fine however, if opening in Internet Explorer, it's got some overlapping issues. Thanks for the feedback. It works OK in my IE (except for the wonky ad). Glad that you enjoy my stuff.